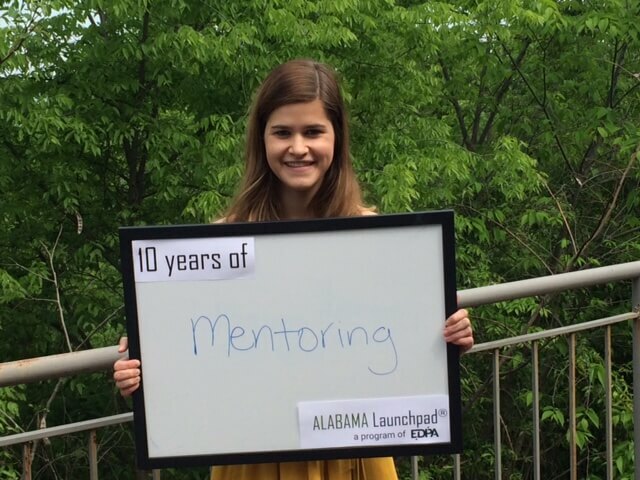 Alabama Launchpad Analyst, Mary Hope Garmon, shares what 10 years of Launchpad means to her: Mentoring. For budding entrepreneurs, starting a company can be an isolated endeavor, full of unknowns and risks. A look at the survival rates of new businesses show that startups need all the help they can get. According to the Small Business Administration’s Office of Advocacy, about half of new establishments survive five years or more and about one-third survive 10 years or more. Alabama Launchpad’s mission is to make sure entrepreneurs in Alabama have access to the necessary resources to flourish, including non-financial support in the form of mentorship. In its 10-year history, Alabama Launchpad, a program of the Economic Development Partnership of Alabama, has presented opportunities for startups participating in Launchpad competitions to get acquainted with experienced entrepreneurs and executives in their communities who serve as mentors and can help them shape their startups into an investible company. A mentor can, among other things, provide pointers on business strategy, bolster networking efforts or act as confidantes. Throughout the state, including Huntsville, Tuscaloosa, Birmingham, Auburn and Mobile, mentors stand ready to help. It’s not uncommon for former Alabama Launchpad competitors to mentor rising startups at Launchpad pitch events. Such was the case when 2010 Alabama Launchpad competition winner Dr. Michael Chambers, president and CEO of Swift BioTech, traveled from Mobile to support 2015 competitor Bright Willow founder Lisa Jernigan at a pitch event. In Birmingham entrepreneurs can gain assistance through the Birmingham Business Alliance’s Spark Mentoring and Coaching Program for Alabama Launchpad. The program provides startups with access to experts who provide assistance with business plan development, and coaches also participate in “Pitch Clinics” to give participants lots of opportunities to prepare to pitch in front of the Launchpad judges, according to Victor Brown, BBA’s vice president of Small Business Development. The mentors who are chosen are often past and/or current entrepreneurs and business owners who’ve achieved tremendous success in technology, innovation, serial entrepreneurship and/or significant and scalable revenue growth worthy of venture capital investment. In some cases, mentors have built enterprises that are among the fastest growing and largest companies in the nation, Brown noted. Brown echoes how important mentors are to fledgling companies. In Hunstville, we were thrilled to see Rocket Hatch founder Antonio Montoya cheering on the three Rocket Hatch-mentored startups, which all landed a combined $166,000 in funding, at our December 2015 finale. As we celebrate 10 years, we are proud to have linked mentees to mentors who can act as role models and encourage them to take the next step, to reach for higher goals and push them to lean in. There is no substitute for another person you trust who can teach from experience. Brooke Battle, founder of Swell Fundraising and a 2014 Alabama Launchpad Startup Competition winner, knows this all too well in the desire for mentoring. Click here to visit our website to learn more about Alabama Launchpad’s mentoring efforts.